One of the biggest trends of this century is extending your living spaces to the outdoors. This is achieved through sliding glass doors the size of walls being opened up to an extension of the home or creating an outdoor kitchen or living room. Here are the most popular trends uncovered over the years of extending living to the back yard. You’ve seen it in magazines, the romantic dinner party outside at night under a pergola wrapped in white outdoor lights. The table is clothed and set just as you would indoors, real napkins, real silverware, plates, and wine glasses. Bringing your dining room outdoors is an ideal way to enjoy the best seasons of the year, whether you have sunshine all year or just in summer months. This is especially a great option for those that don’t have a designated dining space or have had to convert theirs into a space for another purpose. The trick for bringing living spaces outside is to not shy away from bringing indoor items out, including throw pillows, blankets and rugs. The best outdoor spaces look indoors except for the amazing backdrop of lush green landscaping. A newer concept being made popular is enclosing your gazebo with colored curtains and possibly bug nets, for privacy and for comfort. This space can be a romantic outdoor bedroom or living space meant for entertaining, meditation, or as a studio for an artist. The possibilities are endless! Accessorizing a gazebo with a decorative arch leading in further presents the structure as a permanent space and really adds to its majestic sacredness. You can also fence the gazebo or plant shrubs around it to add to its curb appeal. Adding mulched beds, or making decorative brick or stone walkways can also add to its charm. A fire pit is most people’s first thought and is one of the easiest and budget friendliest outdoor living spaces to create. Fire pits can be more permanent structures or can be achieved through portable fire cages. Some beautiful outdoor fire spaces have even been created with an outdoor fireplace! Neater, more contemporary designs are also coming out that are worth considering. Different materials and design can really elevate a property and its curb appeal. Designing your deck around a hot tub is a great idea. If you entertain adults a lot or your work is very physically demanding, this option might be your favorite. The outdoor dining space is a simpler version of the outdoor kitchen and is for those who prefer to cook inside and enjoy the food outside. 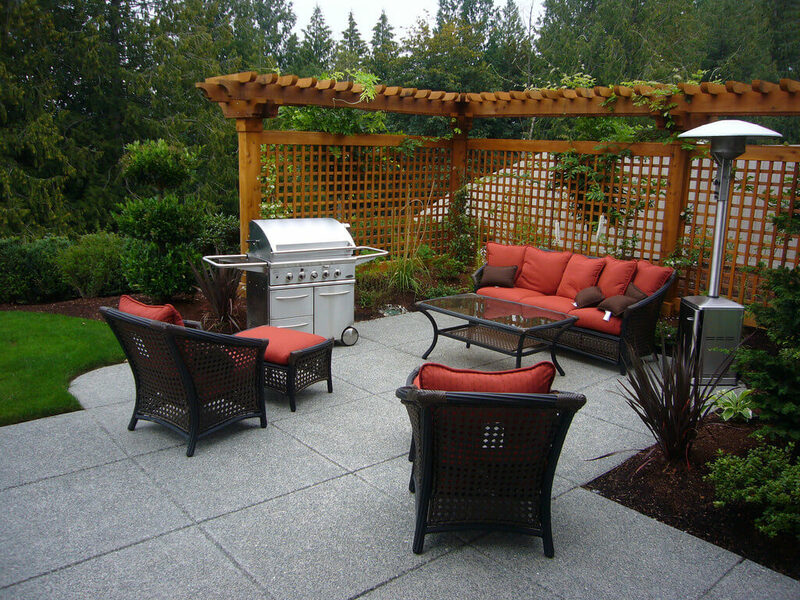 For the avid griller or outdoor cook however, the outdoor kitchen can be an amazing space. Options and add-ons for grills are endless, including outdoor refrigerators and granite countertops. This is a really fun option that leaves a lot of room to consider your cooking style, needs, and design preferences. Tree houses are less popular but still a contender for an outdoor living space. The most important thing in deciding to build a tree house is whether you have a strong enough tree to hold the space and if your county or city will permit it. The idea can be a romantic one for adult guests or children, if you have them.